Korean Air plans to migrate all its applications and data to AWS Cloud over the next 3 years. This forms part of its KRW 200bn ($180m) investment over the next ten years to transform its IT infrastructure. 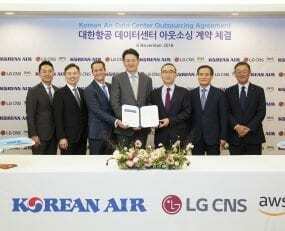 This will see all websites, cargo management system, flight control system, enterprise resource planning (ERP), and other systems, move to the Cloud which are currently operating under Korean Air’s datacenter in Banghwa-dong, Seoul. Korean Air is looking to leverage new technologies on the AWS Cloud to gain information on customer behaviour and improve operational efficiencies. On the operations side, through the analysis of big data from in-flight sensors and maintenance operations, Korean Air is hoping to optimise flight routes, save fuel, and enhance predictive flight maintenance. In addition, Korean Air will use AI technology to analyse system log files, in an attempt to improve flight safety and operational efficiency by automatically scaling up to deliver required resources when there are traffic spikes.